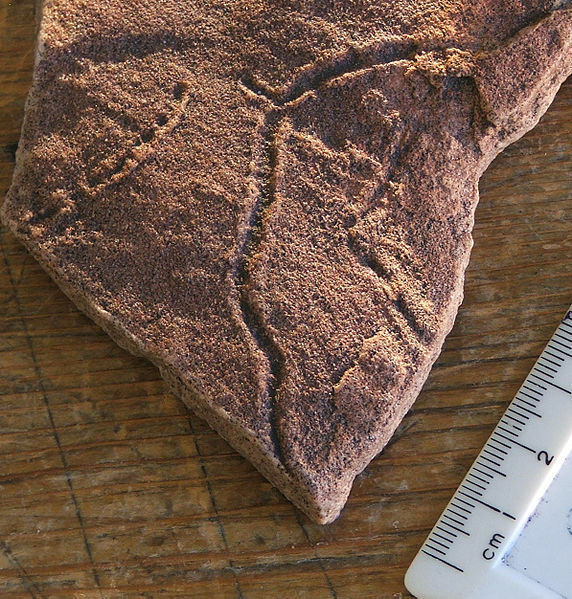 Cambrian life and evolution: Something Ediacaran moves! This is a truly remarkable piece of evidence showing movement in the early biosphere of our planet. The piece of rock is apparently covered with microbial matt. These are ".. areas of sediment stabilised by the presence of colonies of microbes which secrete sticky fluids or otherwise bind the sediment particles". But what we see in this photo is no illusion. Something moved burrowing itself through a soft material leaving tell-tale traces. The surface fossilised turning into stone and thus allowing us to see the trail of some most fragile living thing that lived and moved some five hundred million years ago! Such discoveries demonstrate the accuracy of the observation of phenomena and the formulation of logical and highly intelligent theories to explain them in human brain. In believing eyes these fossils belong to the category of divine Nature Reserves; rare evidence of wonders in the history of natural life that the God of Israel has planted here and there on our planet for His beloved creatures, human beings, to discover, study and joyfully praise Him, the Creator. and we can all say: really, it seems that it is something living that moved after more than two thousand million years of living organisms not been able to move.